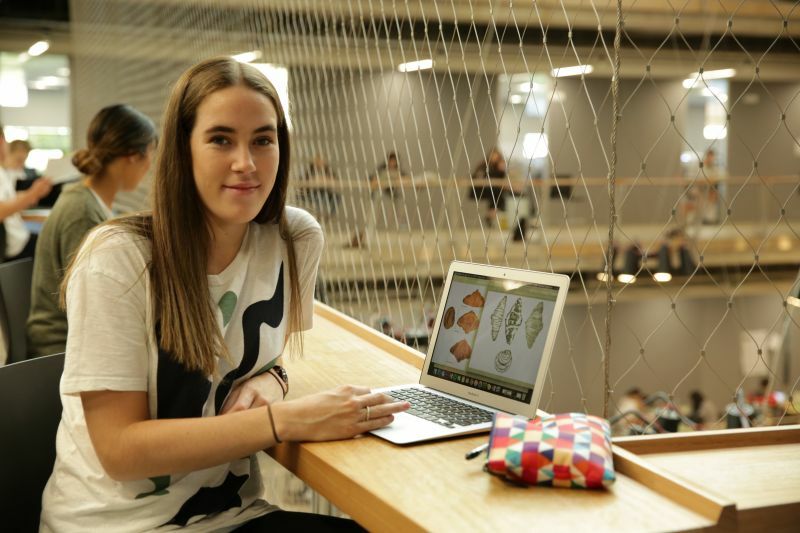 Laura Brown is amongst the first cohort of students to undertake the Bachelor of Design, commencing study in Semester 1, 2017 and is the first recipient of the DELWP Diversity and Inclusion Scholarship. What attracted you to study the Bachelor of Design? I’m very design oriented, so I was drawn to the Bachelor of Design as soon as I heard about it. I did two visual portfolio subjects in Year 12 and I think that gave me a good understanding of being in a creative field and made me realise I wanted to continue in that area. With urban planning in particular, I always felt like it’s a field that’s going to be really useful in the future, and I feel like you can really make a positive difference working in planning. At the moment, I’m considering an architecture and urban planning double major. You are halfway through your first semester of the Bachelor of Design, how are your classes going? My classes are all going really well. They are very interesting and there’s a lot of work to do. The Bachelor of Design degree has a really high amount of contact hours and study time, which is great because I’m learning so much, but it also means I’m really, really busy. I’m enjoying all the classes and I’m really enjoying the drawing aspect of some of the classes. The first-year subjects are all about providing you with a broad spectrum of all the disciplines, and a foundation in design knowledge. In my classes, we are covering some more technical, computer-focused topics, as well as drawing skills, history, design and urban planning. One of the subjects I’m doing is called Cities Past and Future, looking at different planning that has gone into older cities throughout history, and the planning that currently goes into newer cities. The subject explores the similarities and differences of the cities over the years, and looks at planning trends moving forward too. Another subject I’m doing is called Global Foundations of Design, which is more about the history of how cities formed and how different practices and religions influenced the formation of cities around the world. It’s really interesting to learn about all the different elements that come together to actually form and influence the development of a city. What has been your favourite class experience so far? Probably the croissant class – also known as Foundations of Design: Representation – because it has been so abstract. The subject asked us to buy and photograph a croissant, then cut it and take an internal photo of the different sections. We then put the images on a computer and eventually turned the two-dimensional sections into a three-dimensional plan. We used all different skills and software, for example, InDesign, Photoshop and Illustrator. Ultimately, we learnt how to use relevant computer programs to pick apart a design. It was a good introduction of these basics and what’s to come in the degree. Now that I understand what the principles of doing it were (sections and plan views) and how it can be related to technical drawing in any field, I feel it’s really interesting to analyse an object (a croissant) that you wouldn’t normally associate with design or drawing and schematics – I would never look at a croissant otherwise and think about all the layers, and why it’s held up structurally. It’s given me a broader view of how buildings are made. In the second half of semester we are moving on to 3D software Rhino, and we will be making a three-dimensional world based on a section from the Nintendo game Super Mario Bros. We have all been allocated a section and we take two designs – a front view and a back view – and then we will create a world in the in-between space, so I’m looking forward to that. What do you think are the top planning challenges facing your community, and how do you see your studies assisting you in addressing these challenges in the future? I come from a rural community, and I know first-hand that rural communities can face many difficulties when it comes to accessing basic services. Rural residents can live hours away from cities and access to schools, healthcare, libraries and infrastructure that people take for granted in cities. For schooling, kids often need to be sent off to boarding schools and they are essentially separated from their families in order to get a good education. It’s not ideal. I have a lot of Indigenous and non-Indigenous friends that moved from remote communities to these massive private boarding schools, and they just felt so lost. They were no longer with their community or their family, and they were put in this big unfamiliar environment. I know many of them would have preferred to even travel an hour each way to school if it meant having the opportunity to stay with their family, instead of being in a boarding school. I think the Bachelor of Design opens up possibilities. Coming in to the Bachelor of Design and thinking about urban planning, I’d like to one day be equipped to go back to rural communities and build infrastructure, or schools or housing, that really benefits the community. Often rural residents have to travel long distances to access basic facilities like health care or schooling. So, with this scholarship, I feel like I can see myself more easily being in a career role where I could facilitate access to this infrastructure for rural communities. What’s your favourite place on campus? Um, the Melbourne School of Design! I’m biased but I do really love this building. It’s a great place to study and there’s always people here that you can ask for help if you need to. Also, Murrup Barak which is the University of Melbourne Institute for Indigenous Development, is really helpful with a lot of computer and printing resources, and there are always people available to talk to if you need. The billiards room in Union House is always fun too. I love the South Lawn as well. It’s so calming and peaceful. It feels like you are just sitting at the park. That’s a big advantage of the Parkville campus – there are a lot of open spaces here. If you think about other city university campuses, I imagine it would be a lot harder to find a big open grassy space that makes you forget you are in the city or at uni. In that sense, the campus here was really well-planned. Our Bachelor of Design + Master of Architecture course combination is accredited by the Australian Institute of Architects, the Architects Registration Board of Victoria and the Commonwealth Association of Architects.